In the Second Grade, Cub Scouts work toward the Wolf Badge, then toward a Gold Arrow Point and one or more Silver Arrow Points. 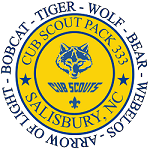 The requirements for these badges are found in the Wolf Cub Scout Book (#33450). To earn the Wolf rank a Cub Scout must complete 58 tasks out of a possible 74 tasks that are offered in the book. Note that these activities are primarily done at home and signed off by the parent after the boy has completed each task. The book is then shown to the Den Leader who records the progress and also signs the boy's book. any three Arrow Point electives. phone or in a central place in your home. Update it often. Lock all of the doors. of your jobs and mark off when you have finished them. Do this for one month. at school and in other areas of your life. hopeful and cheerful attitude help you to keep looking for more items. b. Make a collection of anything you like. Start with 10 things. Put them together in a neat way. c. Show and explain your collection to another person. respect to our world? Why is it important to respect our environment and natural resources? How can you show respect for your environment? of litter. Name one thing you can do to help the environment. Know. Discuss these questions with your family: How does being responsible help us be safe? Within the past week, how did you show responsibility? Commit. Discuss these questions with your family: What happens when people are not responsible? What things can make you forget to be responsible? What things will help you be more responsible? b. WITH AN ADULT, check your home for hazards and know how to make your home safe. c. WITH AN ADULT, check your home for danger from fire. when they are doing things together? Name some ways that you can be helpful and cooperate with others. b. Make a game like one of these. (Eagle Golf, Beanbag Archery.) Play it with your family. d. Read a book or Boys' Life magazine with your family. Take turns reading aloud. f. Attend a concert, a play, or other live program with your family. an inner strength based on their trust in a higher power or cause. Discuss the good qualities of these people. courage in each one to do What is right. courageous to do the right thing. members, act out the choices you would make for some of the requirements. would you do if you were Jason? not. Lee is alone. What would you do if you were Lee? tease him. They want you to tease him, too. What would you do? would you do if you were Juan? wants to read the meter. She is not wearing a uniform. What would you do if you were Chris? h. Sam is home alone. He looks out the window and sees a man trying to break into a neighbor's back door. What would you do if you were Sam? to the dog. They want you and your friends to call the dog, too. What would you do? sister on a walk around the block. What would you do?